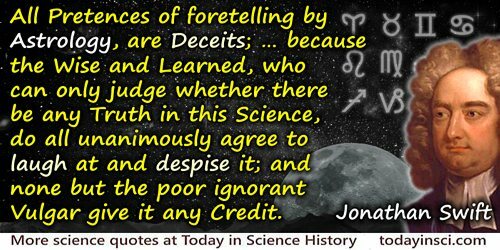 All Pretences of foretelling by Astrology, are Deceits; for this manifest Reason, because the Wise and Learned, who can only judge whether there be any Truth in this Science, do all unanimously agree to laugh at and despise it; and none but the poor ignorant Vulgar give it any Credit. 'An Account of the Death of Mr. Patrige' (1708), collected in The Works of Jonathan Swift (1746), Vol. 1, 124. In 1944 Erwin Schroedinger, stimulated intellectually by Max Delbruck, published a little book called What is life? It was an inspiration to the first of the molecular biologists, and has been, along with Delbruck himself, credited for directing the research during the next decade that solved the mystery of how 'like begat like.' Max was awarded this Prize in 1969, and rejoicing in it, he also lamented that the work for which he was honored before all the peoples of the world was not something which he felt he could share with more than a handful. Samuel Beckett's contributions to literature, being honored at the same time, seemed to Max somehow universally accessible to anyone. But not his. In his lecture here Max imagined his imprisonment in an ivory tower of science. 'The Polymerase Chain Reaction', Nobel Lecture (8 Dec 1993). In Nobel Lectures: Chemistry 1991-1995 (1997), 103. In [David] Douglas's success in life ... his great activity, undaunted courage, singular abstemiousness, and energetic zeal, at once pointed him out as an individual eminently calculated to do himself credit as a scientific traveler. In 'Extracts from A Brief Memoir of the Life of David Douglas' (1834), in W.F. Wilson (ed. ), David Douglas, Botanist at Hawaii (1919), 12. It’s not the critic who counts; not the man which points out how the strong man stumbles or where the doer of deeds could have done them better. The credit belongs to the man who is actually in the arena, whose face is marred by dust and sweat and blood; who strives valiantly; who errs, who comes short again and again … who knows great enthusiasms, the great devotions; who spends himself in a worthy cause; who at the best knows in the end the triumph of high achievement, and who at the worst, if he fails, at least fails while daring greatly, so that his place shall never be with those cold and timid souls who neither know victory nor defeat. In Joseph A. Califano, Jr., Inside: A Public and Private Life (2005), 356. I’ve met a lot of people in important positions, and he [Wernher von Braun] was one that I never had any reluctance to give him whatever kind of credit they deserve. He owned his spot, he knew what he was doing, and he was very impressive when you met with him. He understood the problems. He could come back and straighten things out. He moved with sureness whenever he came up with a decision. Of all the people, as I think back on it now, all of the top management that I met at NASA, many of them are very, very good. But Wernher, relative to the position he had and what he had to do, I think was the best of the bunch. One must credit an hypothesis with all that has had to be discovered in order to demolish it. The major credit I think Jim and I deserve … is for selecting the right problem and sticking to it. It’s true that by blundering about we stumbled on gold, but the fact remains that we were looking for gold. Both of us had decided, quite independently of each other, that the central problem in molecular biology was the chemical structure of the gene. … We could not see what the answer was, but we considered it so important that we were determined to think about it long and hard, from any relevant point of view. In What Mad Pursuit (1990), 74-75. There are those who say we cannot afford to invest in science, that support for research is somehow a luxury at moments defined by necessities. I fundamentally disagree. Science is more essential for our prosperity, our security, our health, our environment, and our quality of life than it has ever been before. … we can't allow our nation to fall behind. Unfortunately, that's exactly what's happened. Federal funding in the physical sciences as a portion of our gross domestic product has fallen by nearly half over the past quarter century. Time and again we've allowed the research and experimentation tax credit, which helps businesses grow and innovate, to lapse. Speech to the National Academy of Sciences Annual Meeting (27 Apr 2009). This [the fact that the pursuit of mathematics brings into harmonious action all the faculties of the human mind] accounts for the extraordinary longevity of all the greatest masters of the Analytic art, the Dii Majores of the mathematical Pantheon. Leibnitz lived to the age of 70; Euler to 76; Lagrange to 77; Laplace to 78; Gauss to 78; Plato, the supposed inventor of the conic sections, who made mathematics his study and delight, who called them the handles or aids to philosophy, the medicine of the soul, and is said never to have let a day go by without inventing some new theorems, lived to 82; Newton, the crown and glory of his race, to 85; Archimedes, the nearest akin, probably, to Newton in genius, was 75, and might have lived on to be 100, for aught we can guess to the contrary, when he was slain by the impatient and ill mannered sergeant, sent to bring him before the Roman general, in the full vigour of his faculties, and in the very act of working out a problem; Pythagoras, in whose school, I believe, the word mathematician (used, however, in a somewhat wider than its present sense) originated, the second founder of geometry, the inventor of the matchless theorem which goes by his name, the pre-cognizer of the undoubtedly mis-called Copernican theory, the discoverer of the regular solids and the musical canon who stands at the very apex of this pyramid of fame, (if we may credit the tradition) after spending 22 years studying in Egypt, and 12 in Babylon, opened school when 56 or 57 years old in Magna Græcia, married a young wife when past 60, and died, carrying on his work with energy unspent to the last, at the age of 99. The mathematician lives long and lives young; the wings of his soul do not early drop off, nor do its pores become clogged with the earthy particles blown from the dusty highways of vulgar life. In Presidential Address to the British Association, Collected Mathematical Papers, Vol. 2 (1908), 658. To Descartes, the great philosopher of the 17th century, is due the undying credit of having removed the bann which until then rested upon geometry. The analytical geometry, as Descartes’ method was called, soon led to an abundance of new theorems and principles, which far transcended everything that ever could have been reached upon the path pursued by the ancients. In Die Entwickelung der Mathematik in den letzten Jahrhunderten (1884), 10. We believe one magnificent highway of this kind [the Lincoln Highway], in actual existence, will stimulate as nothing else could the building of enduring highways everywhere that will not only be a credit to the American people but that will also mean much to American agriculture and American commerce. From Letter (24 Sep 1912) to his friend, the publisher Elbert Hubbard asking for help facilitating fund-raising. In Jane Watts Fisher, Fabulous Hoosier: A Story of American Achievement (1947), 79. When men die of disease they are said to die from natural causes. When they recover (and mostly they do) the doctor gets the credit of curing them. Letter (5 Mar 1877) to Alexander Graham Bell. Quoted in The Bell Telephone (1908), 168. [I attach] little importance to physical size. I don’t feel the least humble before the vastness of the heavens. The stars may be large, but they cannot think or love; and these are qualities which impress me far more than size does. From a paper read to the Apostles, a Cambridge discussion society (1925). In 'The Foundations of Mathematics' (1925), collected in Frank Plumpton Ramsey and D. H. Mellor (ed. ), Philosophical Papers (1990), Epilogue, 249. Citation to the paper, in Nils-Eric Sahlin, The Philosophy of F.P. Ramsey (1990), 225.